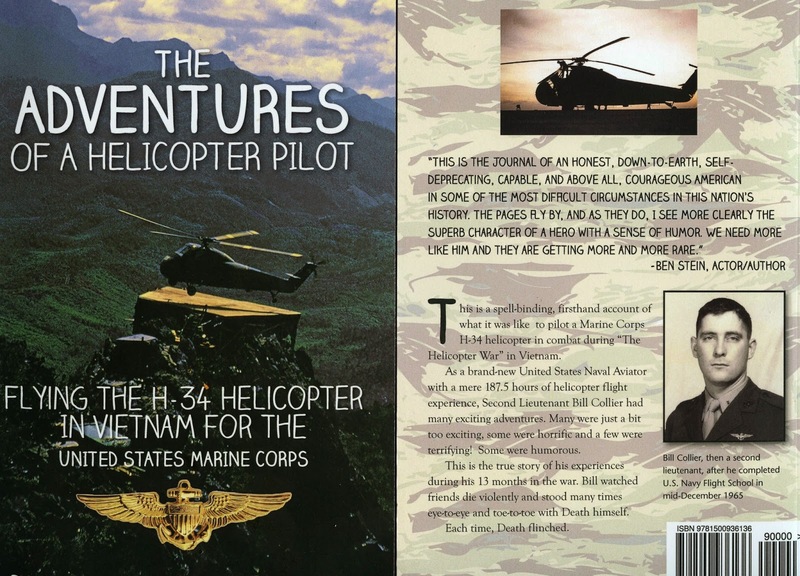 If you have been enjoying this blog about old Charlie the H-34 and all things helicopter, and some of the stories I have written about my experiences as a pilot of these machines in Vietnam, then you will like my book. "The ADVENTURES OF A HELICOPTER PILOT"
by Captain Bill Collier, USMCR. "This is the journal of an honest, down to earth, self-deprecating, capable, and above all, courageous American in some of the most difficult circumstances in this nation's history. The pages fly by and as they do, I see more clearly the superb character of a hero with a sense of humor. We need more like him and they are getting more and more rare. Attention must be paid!" Ben Stein, Actor/Author, man of many talents. For the first 10 people who write a review on amazon, I have a free copy of my 25 minute historical documentary, "The Rescue of Raven 1-1." Buy the book, read it, post a review and then let me know so I can send you the DVD.